As part of its ongoing mission to exceed the expectations of performance-minded enthusiasts in Kuwait, Exclusive to Alghanim Auto, the 2017 Ford Mustang Shelby GT350 is now available in its showroom in 3 new colors: Grabber Blue, Lightning Blue, and Ruby Red. As a masterpiece of form beautifully following function, the 2017 Shelby GT350 embodies the pure exhilaration that enthusiasts have come to expect all while being generously packaged with great services and benefits by Alghanim Auto. Indeed, as the only destination in Kuwait to feature the 2017 Shelby GT350, customers are encouraged to pre-book their favorite world-class sports car at the earliest opportunity by either calling 1898900 or visiting the new showroom in the Shuwaikh Industrial Area. The new GT350 builds on Carroll Shelby’s original idea – transforming a great every-day car into a dominant road racer – by taking advantage of a dramatically improved sixth-generation Mustang to create a truly special driving experience. Driving enthusiasts behind the wheel of a Shelby GT350 can expect to be treated to the most balanced, nimble and exhilarating production Mustang yet. Ford engineers took an innovative approach with GT350. Rather than develop individual systems to perform well independently, every component and shape is optimized to work in concert; balance is the key. While paying rigorous attention to detail, the team pushed the envelope with cutting-edge materials and technologies. 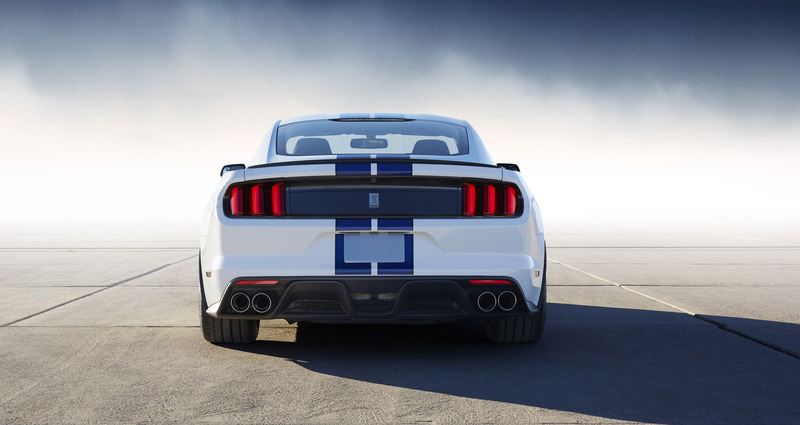 The star of the Shelby GT350 suspension is the first-ever Ford application of continuously variable MagneRide dampers. This is a system designed not just to make the car handle better, but to instill greater confidence in even the best driver. With near instant adjustment of the suspension performance, the system adapts to constantly changing road and driving conditions for optimum handling performance. Due to the significant speeds the car can develop, the GT350 features the most track-credible brake system ever offered on a Ford vehicle in terms of absolute stopping power, fade resistance and brake pedal feel. 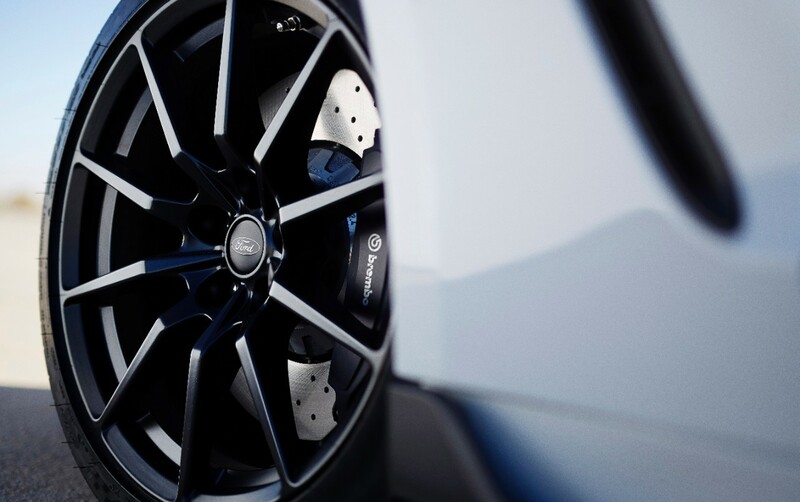 The brakes are two-piece cross-drilled iron brake discs with massive 394-millimeter Front rotors clamped by Brembo six-piston fixed calipers and 380-millimeter rotors at the rear clamped by four-piston calipers. The new Mustang platform is the strongest in the history of the brand, with torsional stiffness increased 28 percent over the previous model. That stiff structure ensures the suspension geometry remains consistent, even under hard driving on back roads and tracks. The front track has been increased while spring rates and bushings have been recalibrated all around, with ride height reduced compared to Mustang GT. The Shelby GT350 has been weight-optimized to balance capability with on-track durability. 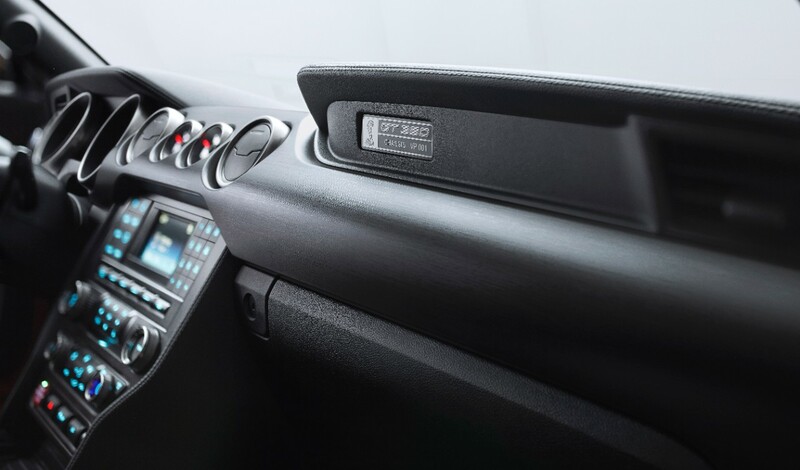 Lightweight components are engineered to offset added extreme-performance hardware, and, as a result, the standard GT350 tips the scales at 1,705 kilograms. GT350 makes use of extra-stiff 19-inch aluminum alloy wheels – 10.5 inches wide in front, 11.0 inches in the rear – clad in state-of-the-art Michelin Pilot Super Sport tires specifically designed to deliver maximum grip on both the road and the track. 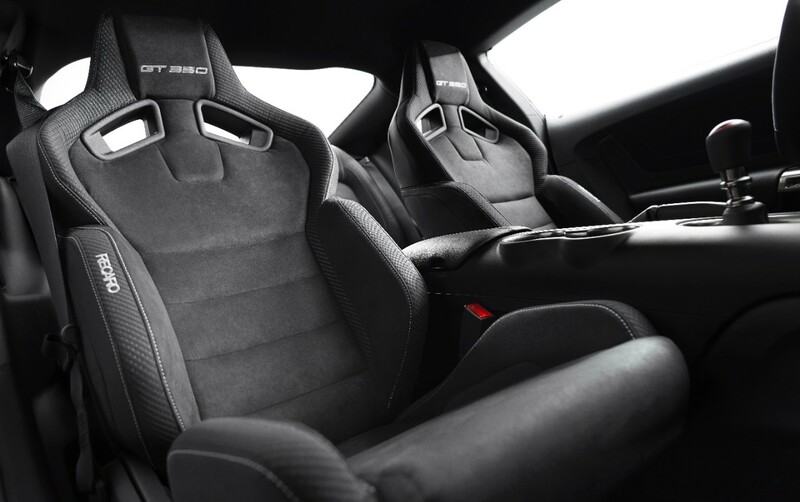 Like everything else about GT350, the interior has been optimized for driving, beginning with the specially designed Recaro sport seats with a unique cloth that is both comfortable in daily driving and capable on the track. A flat-bottom steering wheel makes it easier for the driver to get in and out and more ergonomic on the racetrack. Gauges are upgraded to reflect the enormous performance capability of the car, finished off with aluminum interior trim for that sporty look. The advanced technology inherent to Mustang has been deployed for duty in the Shelby GT350. An all-new integrated driver control system allows selection of five unique modes that tailor ABS, stability control, traction control, steering effort, throttle mapping, MagneRide tuning and exhaust settings depending on driver preference to achieve maximum performance. Shelby GT350® Mustang features Performance Shift Light Indicator display with Track, Tach and Drag mode. This Performance Shift Light Indicator provides the benefits of a shift light while allowing drivers to keep their eyes on the track at all times. The technology behind Heads-up shift light was developed by reimagining existing hardware and is standard on all-new Shelby GT350. All Ford enthusiasts interested in in the Shelby GT350 are encouraged visit the Alghanim Auto New Vehicle Showroom, Service and Spare Parts Center in the Shuwaikh Industrial Area, opposite from the Classical Car Museum and Sirbb Circuit. The showroom is open from 9 am to 8 pm everyday except Fridays. To get in touch with Alghanim Auto, customers can simply call the customer care center at 1898900; visit www.fordalghanim.com or directly on social media channels at the handle @FordAlghanim.